Teaching and learning both create stress in students and teachers, especially as learning becomes more high-stakes for everyone. However, through mindfulness activities, teachers and students can become more productive in the process. It helps control emotions, maintain focus, and increase productivity. When emotions run high, you’re going to want to practice these mindfulness techniques in the classroom. Stand with your feet about shoulder width and relax your knees, don’t lock them. Bring your attention to a point in your abdomen about two inches below your navel and about an inch into your body. Spend a few minutes focusing on this point and feeling gravity connecting your body to the Earth. This practice can help with both focusing and calming the body. Instead of worrying about what might happen during class, becoming centered has a focus on the body and making it more connected to the Earth. It’s a type of meditation that allows teachers to center themselves to the world around them. After becoming centered, think about your main objective in teaching students math. Are they learning about ratios? What are their strengths and weaknesses? How can you best serve them? Before responding to what goes on in the classroom, give yourself 3-5 seconds to think about how to respond. Take in the situation, think about solutions, and monitor your emotions throughout. Take a deep breath within these few seconds to help calm your senses. This can even help when being asked the same question a third time, as it often happens in math class that at least one student still doesn’t get it. What approach haven’t you used yet? Take some think time to reflect for a moment and then tackle the issue. Think about a challenging student in the classroom and recall the last time he or she did something you found difficult. Write about how it made you feel emotionally and how your body felt at the time. Just journal all of those feelings out without thinking about how to fix it just yet. Sit and reflect on those feelings for a while. Really focus on how you feel so that the next time, your response will be a conscious response rather than an unconscious response to the behavior. Journaling also helps when trying to think about areas of improvement for teaching math. What went well during your lesson? What needs some work? How can you address the issues to make learning more productive during the next class? Be mindful not just of student strengths and weaknesses but of your own. It seems overwhelming when you are trying to control your classroom but move away from these feelings. All the student wants is your attention. Give each student your full mindful attention and let the know that you see them rather than focusing on how to make them bend to your will. Focus on making connections with students and the students will feel more valued and become more willing to stop negative behaviors. Students want to feel valued and seen by their teachers, and this helps make that connection a real asset. Use a folder with sticky notes to jot own quickly what each student has state during the classroom and look for patterns in their needs. Oftentimes in a math classroom, the students are struggling with a common concept but state it differently. Use their comments to help drive your instruction more productively. There are fantastic websites like GoNoodle.com that help students become more focused and mindful. They can dance, do yoga, or do simple stretches in order to re-center themselves and become more mindful and decrease frustrations from learning difficult math topics. Sometimes, when I see droopy eyelids, I have the students stand up for a moment, and I practice a simple technique where I have them touch their right ear with their left hand, left ear with right hand, etc., until they’re all laughing, awake, and focused again. Learning logs can also help students become more mindful, even in the math classroom. Have students spend a few minutes each day writing about what they’ve learning, what they still want to learn, or what they’re having trouble with in a learning log, which can either be in a notebook or online. Allow them to share these logs with you so that you can also be more mindful of what your students need from you. Learning logs can also help students become more mindful, even in the math classroom. Have students spend a few minutes each day writing about what they’ve learning, what they still want to learn, or what they’re having trouble with in a learning log, which can either be in a notebook or online. Allow them to share these logs with you so that you can also be more mindful of what your students need from you. As another teacher put it, “Focusing on the kids is the teacher’s purpose, in my opinion. 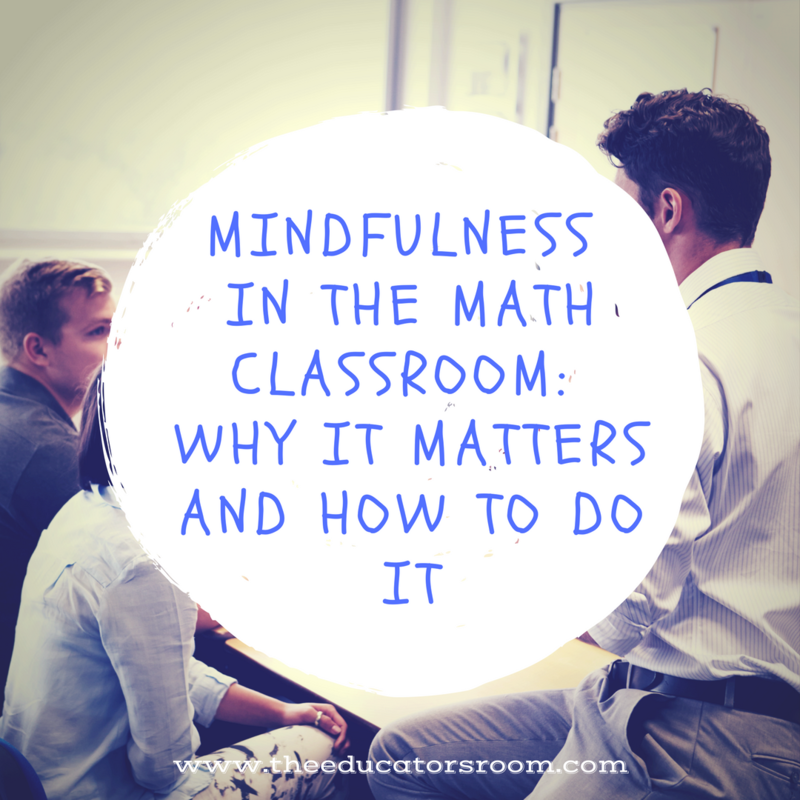 It’s also the easiest and most fun way to be mindful each new day in the classroom.” So spend some time focusing on the kids and their needs while taking the time to practice teaching math mindfully and you, too, can turn your math classroom into a more fun place to learn.